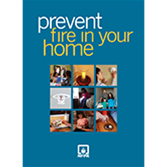 The NFPA® new Prevent Fire In Your Home Booklet is the #1 fire-safety resource for homeowners and families! Most people think a home fire won't happen to them, but a home structure fire is reported every 86 seconds in the United States -- and one civilian fire death occurs about every three hours, according to recent statistics. Help people in your community avert tragedy by observing the fire-safety precautions in NFPA's new Prevent Fire In Your Home Booklet. Automatic sprinklers -- facts and photos that help everyone understand just how effectively sprinklers stop fire in its tracks! Plus information on portable fire extinguishers, electrical hazards, home escape planning and tips for children and other people at higher risk, fire-safe cooking behaviors, generators, grilling safety, and much more! Fire moves so fast, it's easy to underestimate its speed, power, and devastating results.